46 years, 6 months, 3 days old age. 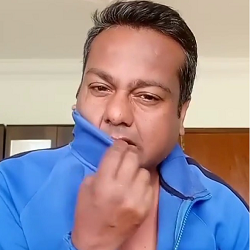 Deepak Kalal will turn 47 on 19 October, 2019. Only 5 months, 26 days, 21 hours, 53 minutes has left for his next birthday. Deepak Kalal has celebrated the total number of 46 birthdays till date. See the analysis by days count and bar graph. Deepak Kalal was born on 19-10-1972 in Pune in the state of Maharashtra, India. He is an Indian YouTube Star, Comedian, Instagram Star & Social Media Star. Deepak Kalal could complete his studies up to 10th class just because of financial conditions. He did a course of cookery from Bandra, Rizvi College of Hotel Management. He likes traveling so much and whenever he visited the Kashmir first time then he shot the video of the valley. Then after he uploaded the video on his social account, which gained the huge popularity to make the social media star. He expressed his views about Kashmir. He said that harmony should be originated in Kashmir and not the violence. Moreover, after his views about Kashmir, one of the tourist websites of Kashmir made him the Kashmir's Brand Ambassador. He expressed his desire to settle in Kashmir. He came into limelight after appearing in the most popular reality show "IGT" in 2018. Soon after, he was approached by the Bigg Boss to make his guest appearance in the show.Despite he refused to make his guest entry into the show. He claims to be a traveling blogger and though he regularly uploaded his videos on the Youtube for making the entertainment of his fans through his videos. He created the sensation on social media after the announcement of his wedding with Raki Sawant on 31st eve at US Los Angeles. He was born to Former Engineer in Mumbai Municipal Corporation Limited (MCL) Vasant Kalal & Lolo Kalal and has a sister named Vrushali Kalal who is an India Actress & Politician. He is in a relationship with Indian dancer/model/actress Rakhi Sawant and the couple will be going to marry on 31-12-2018. Salary In between 10 to 15 lakhs Indian Rupees. Net Worth Rs. 1.25 Crores Indian Rupees (As of 2018). He is a travelling blogger. He wants to settle in Kashmir. He created the sensation on social media after the announcement of his wedding with Raki Sawant on 31st eve at US Los Angeles. He is a hotelier and having a hotel in Goa.